.DLL errors are caused when there is a problem with a .DLL file. These .DLL files control some of the most important parts of the Windows operating system. Programs rely on .DLL files to execute basic commands. And when these .DLL files are missing or corrupt, Windows will slow down, freeze, and display .DLL error messages. Our recommended solution is to download and install the Repair Tool. This tool has been designed to fix .DLL errors while fine tuning PC performance in many other ways. The tool simultaneously fixes Windows problems while enhancing the overall security and performance of any system. Recommended: To fix .DLL errors, use this software package: PC Cleaner Pro. This repair tool has been proven to identify and fix .DLL errors and countless other Windows problems with very high efficiency. What causes .DLL errors? .DLL errors are always caused by problems with a particular .DLL file. When you start up a program – or Windows itself – it looks through the hard drive for important .DLL files. If these .DLL files are missing or corrupt, then the program will not be able to function properly. It could display an error message, for example, or users could experience a crash-to-desktop along with an error message. In some cases, computers with serious .DLL errors may have trouble starting up. It’s important to fix .DLL errors as soon as possible. A .DLL error, when left untreated, can lead to major problems with PC performance and security. 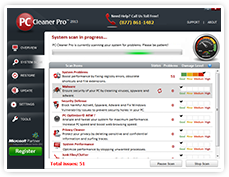 PC Cleaner Pro is designed to fix .DLL errors and all sorts of other PC problems. During a scan, PC Cleaner Pro identifies thousands of areas of the PC that can be optimized. Then, users simply click ‘Fix All’ to instantly repair all these errors. PC Cleaner Pro scans the depths of a PC to find all sorts of errors and junk files that users didn’t even know about. PC Cleaner Pro focuses its search on the Windows Registry. The average Windows Registry contains over half a million files, and these files inevitably develop errors over time. Registry errors can often be linked to .DLL problems, and PC Cleaner Pro is specially designed to repair any files that it comes across with very high efficiency.